How is your research changing the world? Over the past 5 years, we’ve had the opportunity to help over 500 researchers worldwide succeed in their area of study. As we worked alongside these innovative researchers, we asked them what they are passionate about and what they need to be successful. We got a lot of great answers – researchers need access to cutting-edge instrumentation, more time to spend on the important areas of their research, and comprehensive technical support. No matter how a scientist defines success, we are here to help them. This is what inspired Nicoya to rebrand and refine our mission statement – to improve human life by helping scientists succeed. Our new brand has been thoughtfully designed with you in mind, right down to our logo. Each of the three molecules in our logo represents an important facet of who we are as a company, and serves to both motivate and keep us accountable to our three brand promises: Accessibility, Freedom, and Innovation. Researchers spend up to 50% of their time writing grant proposals to obtain the resources they need. We give scientists the freedom to focus on the important areas of their research. From workflow automation to comprehensive, ongoing customer support; we make execution easier and faster so you can focus on analyzing data, publishing literature, and making important connections. To remain ahead of the curve and challenge the status quo, we continuously revolutionize our products and offerings. We seek honest feedback and transparency from researchers so that we can innovate today, not tomorrow. 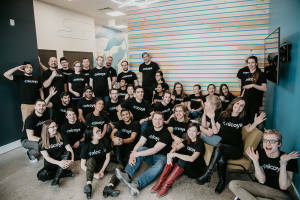 This past year at Nicoya we’ve tripled our staff, released our newest 2-channel version of OpenSPR and moved into a larger office space – and we have no plans on slowing down! Join us on mission to improve human life.